BOOK A WISE GUY WORKSHOP FOR YOUR SCHOOL, BOYS ORGANIZATION OR CHURCH GROUP. John Clark presents: Wise Guy Workshops ©, 60-minute workshops for boys and young men. Wise Guy Workshop 1: How to get Kung-Fu SELF-ESTEEM.© Boys in grades 6-8. Boys learn how to DECODE ads and build their critical thinking skills. 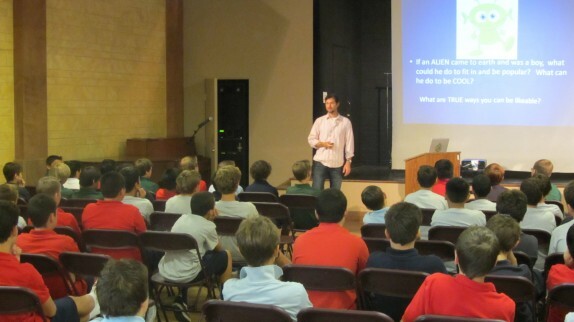 John presents an engaging workshop for boys to share their feelings about self image and pressure from the media to conform to the tough-guy ideal. John reveals the super-power hidden inside everyone. Immunize boys against media manipulation and help them build their self-esteem muscle! (this is the critical age) Not a martial arts class. Wise Guy Workshop 2: Seeing Through the Media Matrix. Young Men in grades 9-12. John Clark supported Nicole in bringing Cover Girl Culture into the world, and is keenly aware of the need to help awaken humanity to the manipulation and dis-empowerment that has gone unchecked for so long. John began his career in the film industry over twenty years ago. He has worked on numerous music videos for artists such as Beck and REM, and helping to create major national TV campaigns, eventually directing commercials in Los Angeles. John met Nicole in Miami on a commercial shoot over fifteen years ago. John is also a children’s book author with Nicole, and illustrator, and a screenwriter having recently optioned a feature film to Sony Pictures Animation. 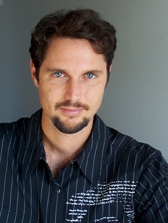 John currently works as a story-writer and is head of visual effects/layout for League of Legends at RIOT. Previously he was the head of layout on animated feature films at Sony Pictures Imageworks, and taught classes at the Gnomon School of Visual Effects in Hollywood. John has developed workshops for boys to shield them from the bombardment of unhealthy messages from the media. He has a degree in History & Education from UCF.